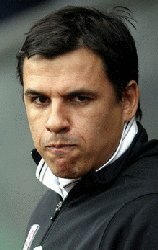 CHRIS COLEMAN lost his job at Fulham after refusing to axe his backroom team. Coleman was called to a meeting in Covent Garden on Tuesday night and told he must part company with Dave Beasant and Steve Kean in a bid to help avoid relegation, but when he stayed loyal he was sacked instead. Ironically, Coleman's successor Lawrie Sanchez reinstated his former Wimbledon team-mate Beasant when he took charge, but there was no way back for Kean who joins Coleman out in the cold. Fulham supporters had called for Coleman's exit after the team's shocking display in the 3-1 defeat at home by Manchester City on Monday. His position had come under even more intense scrutiny after problems in his private life became headline news.